In our daily life and industry, the screw jack is commonly seen as one simple machine. It is also known as worm gear screw jack or worm screw jack. It is a mechanical motion control device used for lifting heavy weight objects, push or pull an object. The key components of screw jacks are trapezoidal lifting screw, worm screw, worm gear and gear housing. Worm screw is rotated manually (manual screw jack) or by a motor (electric screw jack). The screw jack working principle: Worm screw rotate the worm gear; the rotating worm gear move the lifting screw up and down in linear motion way. If input a small rotation force on worm screw, it can amplify force from lifting screw shaft. This mechanical advantage property is good for raising and lowering maintenance platforms, opening and closing air dampers, oven doors, sluice gates, adjusting tooling machine beds. The screw thread of screw jack can be acme screw and ball screw. So there are few variations of the screw jack. Commonly, machine screw jack and ball screw jack can be found in your engineer project. Compared with acme screw, the ball screw is more efficient as there are ball bearings between the nut and screw. The anti-friction ball bearing can increase the ball screw efficiency. A screw jack can add a machine cut lifting nut. 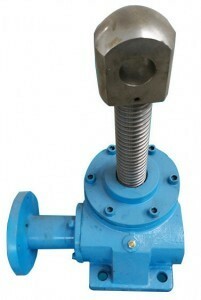 For this model screw jack, only the bronze nut move along with the screw shaft. The lifting screw does not slide. It is similar to the linear actuator working principle which converts rotational motion into linear motion. From this point to understand, an electric linear actuator is a motorized screw jack. The screw jacks can be used separately or in groups connected with drive shafts, joints, couplings, bevel gearboxes and other mechanical components. They also can be driven by different motors: electrical, with either AC motor or DC motor as well as hydraulic or pneumatic motors. All these motion control products can be built in many type jacking system arrangements or configurations. Positioning accuracy up to 0.1 mm. You can use an encoder or drive controller for a closed-loop precision positioning. If you don’t need high-precision, you can equip it with a potentiometer. To achieve synchronous lifting, you can link multiple screw jacks together. Drive system: DC 12 / 24V motor, single AC motor, three-phase AC motor, no air / hydraulic pressure source. Overload protection: It can be equipped with safety clutch or with a pressure sensor to prevent overload. It can withstand a high load, up to 300 tons. Maintenance is easy as it can work properly in low noise, high/ low temperature, and corrosion/explosion-proof harsh environments.